I often get questions about the lighting used on our projects. 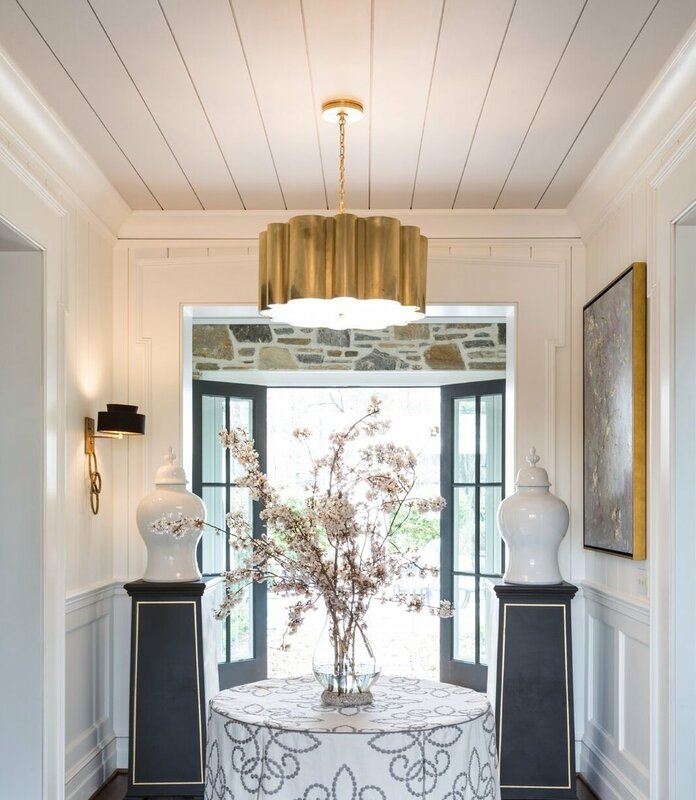 Clients and design enthusiasts are always wondering what the most appropriate lighting for certain rooms is, and how to make a statement in others. I like to tell my clients to think of lighting as "the jewelry of your home." 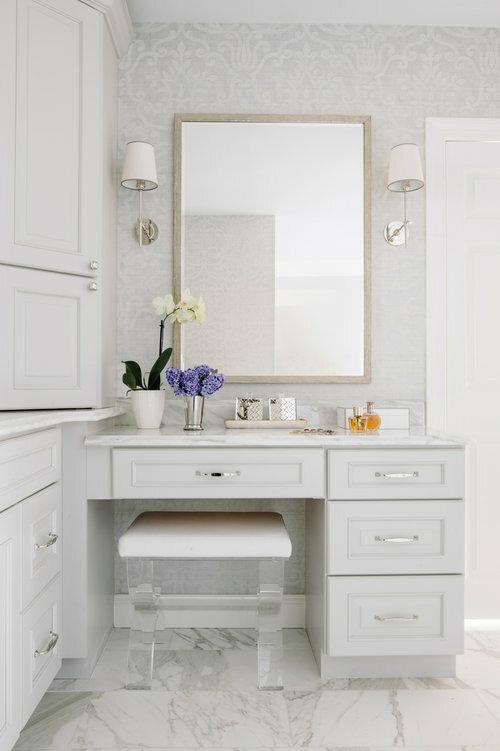 On today's blog I've rounded up some of my favorite fixtures -er gems and how their location suits the look! Keep in mind, of all the things I encourage my clients to purchase online, lighting is definitely one of the things you can confidently buy without needing to hold, touch, and feel. Let us know if any of these pieces resonate with you –they too can be yours. One of the most popular and cost effective ways to upgrade a kitchen is with pendants. Pictured here in our DC project, we updated the kitchen to a more modern-traditional look. 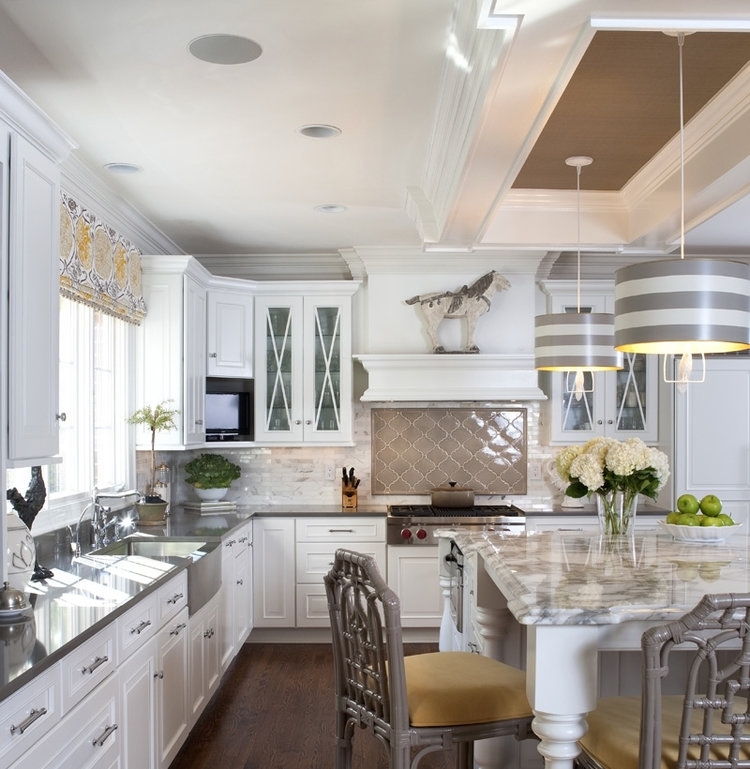 The larger pendants are the perfect scale for a larger island. They have a gold underlay and black chain that provide a modern twist on the classic cone shaped pendant. To the right we created a contemporary look with the help of stunning Barbara Barry pendants. 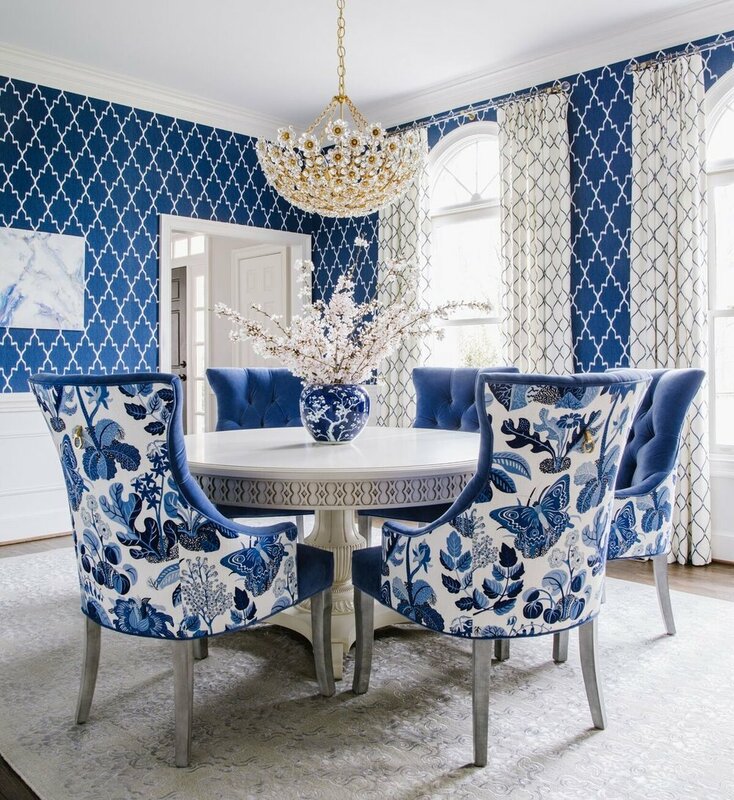 The dining room is the perfect space to let the lighting make a statement. You and your family are not in the dining room everyday (unless you like to eat like a royal). This space is generally reserved for entertaining guests, so give them a show with a fabulous chandelier to ogle over. If dinner wasn't perfection, they'll leave remembering the beauty of the atmosphere. 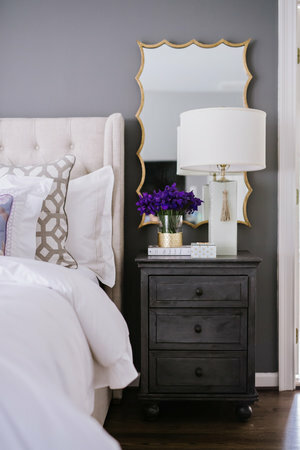 I love the way these chandys make a big pop, even against all the color and pattern play –they play the leading role. The Foyer is sometimes small and other times mighty. But it is your home's first impression. Hence, your light fixture should make a big impact. This is your chance for a dramatic entrance, or at least something that makes you smile each time you walk in the door. 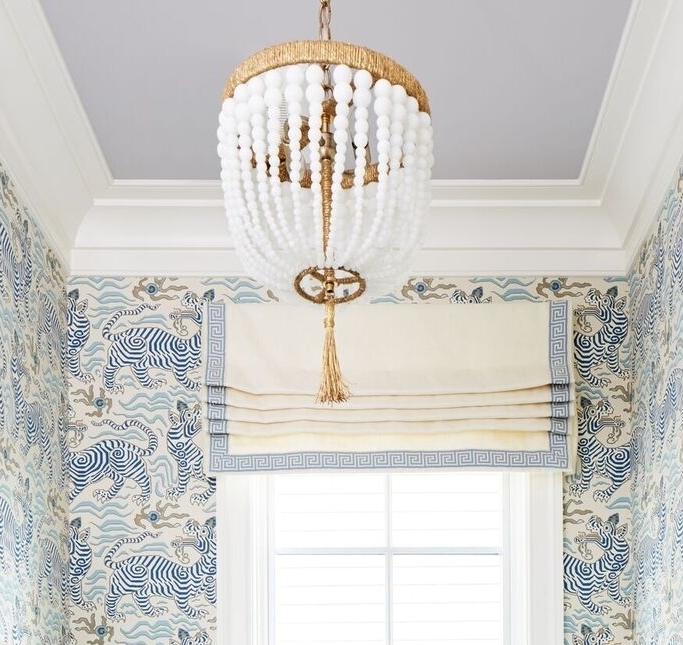 Chandeliers also have their place in a powder room, but there isn't a setting I love more for a gorgeous wall sconce than a bathroom. A little goes a long way when you adorn the walls with the prettiest jewels. Here is the optimal room to set the mood. Below we flanked the bed with a pair of Ro Sham Beaux soft pink table lamps. Size and height are important so we used updated shades. The bedroom is the ideal space in your home to create a romantic and serene sitting area. A morning coffee in PJs may be your only chance in a busy day to steal a tender moment with your spouse. Don't forget to have a little fun in the hallways! Use every possible nook and cranny of your home to create depth and character.